"Second hand smoke" redirects here. For the Sublime album, see Second-hand Smoke. General: overall increased risk; reviewing the evidence accumulated on a worldwide basis, the International Agency for Research on Cancer concluded in 2004 that "Involuntary smoking (exposure to secondhand or 'environmental' tobacco smoke) is carcinogenic to humans." Lung cancer: passive smoking is a risk factor for lung cancer. In the United States passive smoke is estimated to cause more than 7,000 deaths from lung cancer a year among non-smokers. Breast cancer: The California Environmental Protection Agency concluded in 2005 that passive smoking increases the risk of breast cancer in younger, primarily premenopausal females by 70% and the US Surgeon General has concluded that the evidence is "suggestive," but still insufficient to assert such a causal relationship. In contrast, the International Agency for Research on Cancer concluded in 2004 that there was "no support for a causal relation between involuntary exposure to tobacco smoke and breast cancer in never-smokers." A 2015 meta-analysis found that the evidence that passive smoking moderately increased the risk of breast cancer had become "more substantial than a few years ago." Pancreatic cancer: A 2012 meta-analysis found no evidence that passive smoking was associated with an increased risk of pancreatic cancer. Cervical cancer: A 2015 overview of systematic reviews found that exposure to second-hand smoke increased the risk of cervical cancer. Bladder cancer: A 2016 systematic review and meta-analysis found that secondhand smoke exposure was associated with a significant increase in the risk of bladder cancer. Circulatory system: risk of heart disease, reduced heart rate variability. Epidemiological studies have shown that both active and passive cigarette smoking increase the risk of atherosclerosis. Passive smoking is strongly associated with an increased risk of stroke, and this increased risk is disproportionately high at low levels of exposure. According to a 2015 review, passive smoking may increase the risk of tuberculosis infection and accelerate the progression of the disease, but the evidence remains weak. The majority of studies on the association between secondhand smoke exposure and sinusitis have found a significant association between the two. Cognitive impairment and dementia: Exposure to secondhand smoke may increase the risk of cognitive impairment and dementia in adults 50 and over. Children exposed to second-hand smoke show reduced vocabulary and reasoning skills when compared with non-exposed children as well as more general cognitive and intellectual deficits. Mental health: Exposure to secondhand smoke is associated with an increased risk of depressive symptoms. Low birth weight, part B, ch. 3. Premature birth, part B, ch. 3 (Note that evidence of the causal link is described only as "suggestive" by the US Surgeon General in his 2006 report.) Laws limiting smoking decrease premature births. Recent studies comparing females exposed to Environmental Tobacco Smoke and non-exposed females, demonstrate that females exposed while pregnant have higher risks of delivering a child with congenital abnormalities, longer lengths, smaller head circumferences, and low birth weight. Worsening of asthma, allergies, and other conditions. A 2014 systematic review and meta-analysis found that passive smoking was associated with a slightly increased risk of allergic diseases among children and adolescents; the evidence for an association was weaker for adults. Type 2 diabetes. It remains unclear whether the association between passive smoking and diabetes is causal. Risk of carrying Neisseria meningitidis or Streptococcus pneumoniae. A possible increased risk of periodontitis. Overall increased risk of death in both adults, where it is estimated to kill 53,000 nonsmokers per year, making it the 3rd leading cause of preventable death in the U.S, and in children. The World Health Organization states that passive smoking causes about 600,000 deaths a year, and about 1% of the global burden of disease. As of 2017, passive smoking causes about 900,000 deaths a year, which is about 1/8 of all deaths caused by smoking. Skin conditions: A 2016 systematic review and meta-analysis found that passive smoking was associated with a higher rate of atopic dermatitis. Sudden infant death syndrome (SIDS). In his 2006 report, the US Surgeon General concludes: "The evidence is sufficient to infer a causal relationship between exposure to secondhand smoke and sudden infant death syndrome." Secondhand smoking has been estimated to be associated with 430 SIDS deaths in the United States annually. Asthma. Secondhand smoke exposure is also associated with an almost doubled risk of hospitalization for asthma exacerbation among children with asthma. Lung infections, also including more severe illness with bronchiolitis and bronchitis, and worse outcome, as well as increased risk of developing tuberculosis if exposed to a carrier. In the United States, it is estimated that second-hand smoke has been associated with between 150,000 and 300,000 lower respiratory tract infections in infants and children under 18 months of age, resulting in between 7,500 and 15,000 hospitalizations each year. Maternal passive smoking increases the risk of non-syndromic orofacial clefts by 50% among their children. Prenatal and childhood passive smoke exposure does not appear to increase the risk of inflammatory bowel disease. Learning difficulties, developmental delays, executive function problems, and neurobehavioral effects. Animal models suggest a role for nicotine and carbon monoxide in neurocognitive problems. An increase in tooth decay (as well as related salivary biomarkers) has been associated with passive smoking in children. Increased risk of middle ear infections. Maternal exposure to secondhand smoke exposure during pregnancy is associated with an increased risk of neural tube defects. Miscarriage: a 2014 meta-analysis found that maternal secondhand smoke exposure increased the risk of miscarriage by 11%. Anesthesia complications and some negative surgical outcomes. Sleep disordered breathing: Most studies have found a significant association between passive smoking and sleep disordered breathing in children, but further studies are needed to determine whether this association is causal. Adverse effects on the cardiovascular system of children. Exposure to secondhand smoke by age, race, and poverty level in the US. Epidemiological studies show that non-smokers exposed to second-hand smoke are at risk for many of the health problems associated with direct smoking. Most of the research has come from studies of nonsmokers who are married to a smoker. Those conclusions are also backed up by further studies of workplace exposure to smoke. In 1992, a review estimated that second-hand smoke exposure was responsible for 35,000 to 40,000 deaths per year in the United States in the early 1980s. The absolute risk increase of heart disease due to ETS was 2.2%, while the attributable risk percent was 23%. A 1997 meta-analysis found that second-hand smoke exposure increased the risk of heart disease by a quarter, and two 1999 meta-analyses reached similar conclusions. Evidence shows that inhaled sidestream smoke, the main component of second-hand smoke, is about four times more toxic than mainstream smoke. This fact has been known to the tobacco industry since the 1980s, though it kept its findings secret. Some scientists believe that the risk of passive smoking, in particular the risk of developing coronary heart diseases, may have been substantially underestimated. In 1997, a meta-analysis on the relationship between secondhand smoke exposure and lung cancer concluded that such exposure caused lung cancer. The increase in risk was estimated to be 24% among non-smokers who lived with a smoker. In 2000, Copas and Shi reported that there was clear evidence of publication bias in the studies included in this meta-analysis. They further concluded that after correcting for publication bias, and assuming that 40% of all studies are unpublished, this increased risk decreased from 24% to 15%. This conclusion has been challenged on the basis that the assumption that 40% of all studies are unpublished was "extreme". :1269 In 2006, Takagi et al. reanalyzed the data from this meta-analysis to account for publication bias and estimated that the relative risk of lung cancer among those exposed to secondhand smoke was 1.19, slightly lower than the original estimate. A 2000 meta-analysis found a relative risk of 1.48 for lung cancer among men exposed to secondhand smoke, and a relative risk of 1.16 among those exposed to it at work. Another meta-analysis confirmed the finding of an increased risk of lung cancer among women with spousal exposure to secondhand smoke the following year. It found a relative risk of lung cancer of 1.29 for women exposed to secondhand smoke from their spouses. A 2014 meta-analysis noted that "the association between exposure to secondhand smoke and lung cancer risk is well established." A minority of epidemiologists have found it hard to understand how second-hand smoke, which is more diluted than actively inhaled smoke, could have an effect that is such a large fraction of the added risk of coronary heart disease among active smokers. One proposed explanation is that second-hand smoke is not simply a diluted version of "mainstream" smoke, but has a different composition with more toxic substances per gram of total particulate matter. Passive smoking appears to be capable of precipitating the acute manifestations of cardio-vascular diseases (atherothrombosis) and may also have a negative impact on the outcome of patients who suffer acute coronary syndromes. These meta-analyses show that there is a statistically significant and consistent association between lung cancer risk in spouses of smokers and exposure to second-hand tobacco smoke from the spouse who smokes. The excess risk is of the order of 20% for women and 30% for men and remains after controlling for some potential sources of bias and confounding. Subsequent meta-analyses have confirmed these findings. Smoking by either parent, particularly by the mother, increases the risk of asthma in children. The outlook for early childhood asthma is less favourable in smoking households. Children with asthma who are exposed to smoking in the home generally have more severe disease. Many adults with asthma identify ETS as a trigger for their symptoms. Doctor-diagnosed asthma is more common among non-smoking adults exposed to ETS than those not exposed. Among people with asthma, higher ETS exposure is associated with a greater risk of severe attacks. In France, exposure to second-hand smoke has been estimated to cause between 3,000 and 5,000 premature deaths per year, with the larger figure cited by Prime Minister Dominique de Villepin during his announcement of a nationwide smoke-free law: "That makes more than 13 deaths a day. It is an unacceptable reality in our country in terms of public health." There is good observational evidence that smoke-free legislation reduces the number of hospital admissions for heart disease. The International Agency for Research on Cancer of the World Health Organization concluded in 2004 that there was sufficient evidence that second-hand smoke caused cancer in humans. Those who work in environments where smoke is not regulated are at higher risk. Workers particularly at risk of exposure include those in installation repair and maintenance, construction and extraction, and transportation. The US Surgeon General, in his 2006 report, estimated that living or working in a place where smoking is permitted increases the non-smokers' risk of developing heart disease by 25–30% and lung cancer by 20–30%. In the U.S., smokers that have not quit successfully have a risk of lung cancer about 20 times higher than that of never smokers. Breath CO monitor displaying carbon monoxide concentration of an exhaled breath sample (in ppm) with corresponding percent concentration of carboxyhemoglobin displayed below. Environmental tobacco smoke can be evaluated either by directly measuring tobacco smoke pollutants found in the air or by using biomarkers, an indirect measure of exposure. Carbon monoxide monitored through breath, nicotine, cotinine, thiocyanates, and proteins are the most specific biological markers of tobacco smoke exposure. Biochemical tests are a much more reliable biomarker of second-hand smoke exposure than surveys. Certain groups of people are reluctant to disclose their smoking status and exposure to tobacco smoke, especially pregnant women and parents of young children. This is due to their smoking being socially unacceptable. Also, it may be difficult for individuals to recall their exposure to tobacco smoke. A 2007 study in the Addictive Behaviors journal found a positive correlation between second-hand tobacco smoke exposure and concentrations of nicotine and/or biomarkers of nicotine in the body. Significant biological levels of nicotine from second-hand smoke exposure were equivalent to nicotine levels from active smoking and levels that are associated with behaviour changes due to nicotine consumption. Cotinine, the metabolite of nicotine, is a biomarker of second-hand smoke exposure. Typically, cotinine is measured in the blood, saliva, and urine. Hair analysis has recently become a new, noninvasive measurement technique. Cotinine accumulates in hair during hair growth, which results in a measure of long-term, cumulative exposure to tobacco smoke. Urinary cotinine levels have been a reliable biomarker of tobacco exposure and have been used as a reference in many epidemiological studies. However, cotinine levels found in the urine reflect exposure only over the preceding 48 hours. Cotinine levels of the skin, such as the hair and nails, reflect tobacco exposure over the previous three months and are a more reliable biomarker. 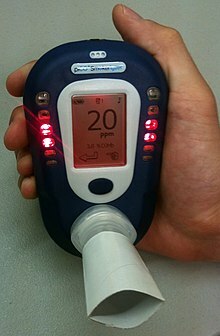 Carbon monoxide monitored via breath is also a reliable biomarker of second-hand smoke exposure as well as tobacco use. With high sensitivity and specificity, it not only provides an accurate measure, but the test is also non-invasive, highly reproducible, and low in cost. Breath CO monitoring measures the concentration of CO in an exhalation in parts per million, and this can be directly correlated to the blood CO concentration (carboxyhemoglobin). Breath CO monitors can also be used by emergency services to identify patients who are suspected of having CO poisoning. A 2004 study by the International Agency for Research on Cancer of the World Health Organization concluded that non-smokers are exposed to the same carcinogens as active smokers. Sidestream smoke contains more than 4,000 chemicals, including 69 known carcinogens. Of special concern are polynuclear aromatic hydrocarbons, tobacco-specific N-nitrosamines, and aromatic amines, such as 4-aminobiphenyl, all known to be highly carcinogenic. Mainstream smoke, sidestream smoke, and second-hand smoke contain largely the same components, however the concentration varies depending on type of smoke. Several well-established carcinogens have been shown by the tobacco companies' own research to be present at higher concentrations in sidestream smoke than in mainstream smoke. Second-hand smoke has been shown to produce more particulate-matter (PM) pollution than an idling low-emission diesel engine. In an experiment conducted by the Italian National Cancer Institute, three cigarettes were left smoldering, one after the other, in a 60 m³ garage with a limited air exchange. The cigarettes produced PM pollution exceeding outdoor limits, as well as PM concentrations up to 10-fold that of the idling engine. Second-hand tobacco smoke exposure has immediate and substantial effects on blood and blood vessels in a way that increases the risk of a heart attack, particularly in people already at risk. Exposure to tobacco smoke for 30 minutes significantly reduces coronary flow velocity reserve in healthy nonsmokers. Second-hand smoke is also associated with impaired vasodilation among adult nonsmokers. Second-hand smoke exposure also affects platelet function, vascular endothelium, and myocardial exercise tolerance at levels commonly found in the workplace. Pulmonary emphysema can be induced in rats through acute exposure to sidestream tobacco smoke (30 cigarettes per day) over a period of 45 days. Degranulation of mast cells contributing to lung damage has also been observed. The term "third-hand smoke" was recently coined to identify the residual tobacco smoke contamination that remains after the cigarette is extinguished and second-hand smoke has cleared from the air. Preliminary research suggests that by-products of third-hand smoke may pose a health risk, though the magnitude of risk, if any, remains unknown. In October 2011, it was reported that Christus St. Frances Cabrini Hospital in Alexandria, Louisiana would seek to eliminate third-hand smoke beginning in July 2012, and that employees whose clothing smelled of smoke would not be allowed to work. This prohibition was enacted because third-hand smoke poses a special danger for the developing brains of infants and small children. In 2008, there were more than 161,000 deaths attributed to lung cancer in the United States. Of these deaths, an estimated 10% to 15% were caused by factors other than first-hand smoking; equivalent to 16,000 to 24,000 deaths annually. Slightly more than half of the lung cancer deaths caused by factors other than first-hand smoking were found in nonsmokers. Lung cancer in non-smokers may well be considered one of the most common cancer mortalities in the United States. Clinical epidemiology of lung cancer has linked the primary factors closely tied to lung cancer in non-smokers as exposure to second-hand tobacco smoke, carcinogens including radon, and other indoor air pollutants. Recent major surveys conducted by the U.S. National Cancer Institute and Centers for Disease Control have found widespread public awareness that second-hand smoke is harmful. In both 1992 and 2000 surveys, more than 80% of respondents agreed with the statement that second-hand smoke was harmful. A 2001 study found that 95% of adults agreed that second-hand smoke was harmful to children, and 96% considered tobacco-industry claims that second-hand smoke was not harmful to be untruthful. A 2007 Gallup poll found that 56% of respondents felt that second-hand smoke was "very harmful", a number that has held relatively steady since 1997. Another 29% believe that second-hand smoke is "somewhat harmful"; 10% answered "not too harmful", while 5% said "not at all harmful". As part of its attempt to prevent or delay tighter regulation of smoking, the tobacco industry funded a number of scientific studies and, where the results cast doubt on the risks associated with second-hand smoke, sought wide publicity for those results. The industry also funded libertarian and conservative think tanks, such as the Cato Institute in the United States and the Institute of Public Affairs in Australia which criticised both scientific research on passive smoking and policy proposals to restrict smoking. New Scientist and the European Journal of Public Health have identified these industry-wide coordinated activities as one of the earliest expressions of corporate denialism. Further, they state that the disinformation spread by the tobacco industry has created a tobacco denialism movement, sharing many characteristics of other forms of denialism, such as HIV-AIDS denialism. A 2003 study by James Enstrom and Geoffrey Kabat, published in the British Medical Journal, argued that the harms of passive smoking had been overstated. Their analysis reported no statistically significant relationship between passive smoking and lung cancer, coronary heart disease (CHD), or chronic obstructive pulmonary disease, though the accompanying editorial noted that "they may overemphasise the negative nature of their findings." This paper was widely promoted by the tobacco industry as evidence that the harms of passive smoking were unproven. The American Cancer Society (ACS), whose database Enstrom and Kabat used to compile their data, criticized the paper as "neither reliable nor independent", stating that scientists at the ACS had repeatedly pointed out serious flaws in Enstrom and Kabat's methodology prior to publication. Notably, the study had failed to identify a comparison group of "unexposed" persons. Enstrom's ties to the tobacco industry also drew scrutiny; in a 1997 letter to Philip Morris, Enstrom requested a "substantial research commitment... in order for me to effectively compete against the large mountain of epidemiologic data and opinions that already exist regarding the health effects of ETS and active smoking." In a US racketeering lawsuit against tobacco companies, the Enstrom and Kabat paper was cited by the US District Court as "a prime example of how nine tobacco companies engaged in criminal racketeering and fraud to hide the dangers of tobacco smoke." The Court found that the study had been funded and managed by the Center for Indoor Air Research, a tobacco industry front group tasked with "offsetting" damaging studies on passive smoking, as well as by Philip Morris who stated that Enstrom's work was "clearly litigation-oriented." A 2005 paper in Tobacco Control argued that the disclosure section in the Enstrom and Kabat BMJ paper, although it met the journal's requirements, "does not reveal the full extent of the relationship the authors had with the tobacco industry." In 2006, Enstrom and Kabat published a meta-analysis of studies regarding passive smoking and coronary heart disease in which they reported a very weak association between passive smoking and heart disease mortality. They concluded that exposure to second-hand smoke increased the risk of death from CHD by only 5%, although this analysis has been criticized for including two previous industry-funded studies that suffered from widespread exposure misclassification. Gio Batta Gori, a tobacco industry spokesman and consultant and an expert on risk utility and scientific research, wrote in the libertarian Cato Institute's magazine Regulation that "...of the 75 published studies of ETS and lung cancer, some 70% did not report statistically significant differences of risk and are moot. Roughly 17% claim an increased risk and 13% imply a reduction of risk." Steven Milloy, the "junk science" commentator for Fox News and a former Philip Morris consultant, claimed that "of the 19 studies" on passive smoking "only 8— slightly more than 42%— reported statistically significant increases in heart disease incidence.."
The tobacco industry and affiliated scientists also put forward a set of "Good Epidemiology Practices" which would have the practical effect of obscuring the link between secondhand smoke and lung cancer; the privately stated goal of these standards was to "impede adverse legislation". However, this effort was largely abandoned when it became clear that no independent epidemiological organization would agree to the standards proposed by Philip Morris et al. In 1995, Levois and Layard, both tobacco industry consultants, published two analyses in the journal Regulatory Toxicology and Pharmacology regarding the association between spousal exposure to second-hand smoke and heart disease. Both of these papers reported no association between second-hand smoke and heart disease. These analyses have been criticized for failing to distinguish between current and former smokers, despite the fact that former smokers, unlike current ones, are not at a significantly increased risk of heart disease. A 1998 study by the International Agency for Research on Cancer (IARC) on environmental tobacco smoke (ETS) found "weak evidence of a dose–response relationship between risk of lung cancer and exposure to spousal and workplace ETS." In March 1998, before the study was published, reports appeared in the media alleging that the IARC and the World Health Organization (WHO) were suppressing information. The reports, appearing in the British Sunday Telegraph and The Economist, among other sources, alleged that the WHO withheld from publication of its own report that supposedly failed to prove an association between passive smoking and a number of other diseases (lung cancer in particular). With the release of formerly classified tobacco industry documents through the Tobacco Master Settlement Agreement, it was found (by Elisa Ong and Stanton Glantz) that the controversy over the WHO's alleged suppression of data had been engineered by Philip Morris, British American Tobacco, and other tobacco companies in an effort to discredit scientific findings which would harm their business interests. A WHO inquiry, conducted after the release of the tobacco-industry documents, found that this controversy was generated by the tobacco industry as part of its larger campaign to cut the WHO's budget, distort the results of scientific studies on passive smoking, and discredit the WHO as an institution. This campaign was carried out using a network of ostensibly independent front organizations and international and scientific experts with hidden financial ties to the industry. In 1993, the United States Environmental Protection Agency (EPA) issued a report estimating that 3,000 lung cancer related deaths in the United States were caused by passive smoking annually. Philip Morris, R.J. Reynolds Tobacco Company, and groups representing growers, distributors and marketers of tobacco took legal action, claiming that the EPA had manipulated this study and ignored accepted scientific and statistical practices. The United States District Court for the Middle District of North Carolina ruled in favor of the tobacco industry in 1998, finding that the EPA had failed to follow proper scientific and epidemiologic practices and had "cherry picked" evidence to support conclusions which they had committed to in advance. The court stated in part, "EPA publicly committed to a conclusion before research had begun…adjusted established procedure and scientific norms to validate the Agency's public conclusion... In conducting the ETS Risk Assessment, disregarded information and made findings on selective information; did not disseminate significant epidemiologic information; deviated from its Risk Assessment Guidelines; failed to disclose important findings and reasoning…"
In 2002, the EPA successfully appealed this decision to the United States Court of Appeals for the Fourth Circuit. The EPA's appeal was upheld on the preliminary grounds that their report had no regulatory weight, and the earlier finding was vacated. In 1998, the U.S. Department of Health and Human Services, through the publication by its National Toxicology Program of the 9th Report on Carcinogens, listed environmental tobacco smoke among the known carcinogens, observing of the EPA assessment that "The individual studies were carefully summarized and evaluated." Philip Morris then expect the group of scientists to operate within the confines of decisions taken by PM scientists to determine the general direction of research, which apparently would then be 'filtered' by lawyers to eliminate areas of sensitivity. Philip Morris reported that it was putting "...vast amounts of funding into these projects... in attempting to coordinate and pay so many scientists on an international basis to keep the ETS controversy alive." Measures to tackle second-hand smoke pose a serious economic threat to the tobacco industry, having broadened the definition of smoking beyond a personal habit to something with a social impact. In a confidential 1978 report, the tobacco industry described increasing public concerns about second-hand smoke as "the most dangerous development to the viability of the tobacco industry that has yet occurred." In United States of America v. Philip Morris et al., the District Court for the District of Columbia found that the tobacco industry "... recognized from the mid-1970s forward that the health effects of passive smoking posed a profound threat to industry viability and cigarette profits," and that the industry responded with "efforts to undermine and discredit the scientific consensus that ETS causes disease." The industry has sought to position the second-hand smoke debate as essentially concerned with civil liberties and smokers' rights rather than with health, by funding groups such as FOREST. Funding bias in research; in all reviews of the effects of second-hand smoke on health published between 1980 and 1995, the only factor associated with concluding that second-hand smoke is not harmful was whether an author was affiliated with the tobacco industry. However, not all studies that failed to find evidence of harm were by industry-affiliated authors. Promoting "good epidemiology" and attacking so-called junk science (a term popularised by industry lobbyist Steven Milloy): attacking the methodology behind research showing health risks as flawed and attempting to promote sound science. Ong & Glantz (2001) cite an internal Phillip Morris memo giving evidence of this as company policy. Creation of outlets for favourable research. In 1989, the tobacco industry established the International Society of the Built Environment, which published the peer-reviewed journal Indoor and Built Environment. This journal did not require conflict-of-interest disclosures from its authors. With documents made available through the Master Settlement, it was found that the executive board of the society and the editorial board of the journal were dominated by paid tobacco-industry consultants. The journal published a large amount of material on passive smoking, much of which was "industry-positive". Citing the tobacco industry's production of biased research and efforts to undermine scientific findings, the 2006 U.S. Surgeon General's report concluded that the industry had "attempted to sustain controversy even as the scientific community reached consensus... industry documents indicate that the tobacco industry has engaged in widespread activities... that have gone beyond the bounds of accepted scientific practice." The U.S. District Court, in U.S.A. v. Philip Morris et al., found that "...despite their internal acknowledgment of the hazards of secondhand smoke, Defendants have fraudulently denied that ETS causes disease." The positions of major tobacco companies on the issue of second-hand smoke is somewhat varied. In general, tobacco companies have continued to focus on questioning the methodology of studies showing that second-hand smoke is harmful. Some (such as British American Tobacco and Philip Morris) acknowledge the medical consensus that second-hand smoke carries health risks, while others continue to assert that the evidence is inconclusive. Several tobacco companies advocate the creation of smoke-free areas within public buildings as an alternative to comprehensive smoke-free laws. destroyed documents relevant to litigation. The ruling found that tobacco companies undertook joint efforts to undermine and discredit the scientific consensus that second-hand smoke causes disease, notably by controlling research findings via paid consultants. The ruling also concluded that tobacco companies were fraudulently continuing to deny the health effects of ETS exposure. On May 22, 2009, a three-judge panel of the U.S. Court of Appeals for the District of Columbia Circuit unanimously upheld the lower court's 2006 ruling. As a consequence of the health risks associated with second-hand smoke, smoke-free regulations in indoor public places, including restaurants, cafés, and nightclubs have been introduced in a number of jurisdictions, at national or local level, as well as some outdoor open areas. Ireland was the first country in the world to institute a comprehensive national smoke-free law on smoking in all indoor workplaces on 29 March 2004. Since then, many others have followed suit. The countries which have ratified the WHO Framework Convention on Tobacco Control (FCTC) have a legal obligation to implement effective legislation "for protection from exposure to tobacco smoke in indoor workplaces, public transport, indoor public places and, as appropriate, other public places." (Article 8 of the FCTC) The parties to the FCTC have further adopted Guidelines on the Protection from Exposure to Second-hand Smoke which state that "effective measures to provide protection from exposure to tobacco smoke ... require the total elimination of smoking and tobacco smoke in a particular space or environment in order to create a 100% smoke-free environment." Opinion polls have shown considerable support for smoke-free laws. In June 2007, a survey of 15 countries found 80% approval for smoke-free laws. A survey in France, reputedly a nation of smokers, showed 70% support. Smoking bans by governments result in decreased harm from second hand smoke including decrease cardiovascular disease. In the first 18 months after the town of Pueblo, Colorado enacted a smoke-free law in 2003, hospital admissions for heart attacks dropped 27%. Admissions in neighbouring towns without smoke-free laws showed no change, and the decline in heart attacks in Pueblo was attributed to the resulting reduction in second-hand smoke exposure. A 2004 smoking ban instituted in Massachusetts workplaces decreased workers' secondhand smoke exposure from 8% of workers in 2003 to 5.4% of workers in 2010. A 2016 review also found benefits of decrease exposure to smoke from specific location policies. In 2001, a systematic review for the Guide to Community Preventative Services acknowledged strong evidence of the effectiveness of smoke-free policies and restrictions in reducing expose to second-hand smoke. A follow up to this review, identified the evidence on which the effectiveness of smoking bans reduced the prevalence of tobacco use. Articles published until 2005, were examined to further support this evidence. The examined studies provided sufficient evidence that smoke-free policies reduce tobacco use among workers when implemented in worksites or by communities. While a number of studies funded by the tobacco industry have claimed a negative economic impact from smoke-free laws, no independently funded research has shown any such impact. A 2003 review reported that independently funded, methodologically sound research consistently found either no economic impact or a positive impact from smoke-free laws. Air nicotine levels were measured in Guatemalan bars and restaurants before and after an implemented smoke-free law in 2009. Nicotine concentrations significantly decreased in both the bars and restaurants measured. Also, the employees support for a smoke-free workplace substantially increased in the post-implementation survey compared to pre-implementation survey. The result of this smoke-free law provides a considerably more healthy work environment for the staff. Recent surveys taken by the Society for Research on Nicotine and Tobacco demonstrates supportive attitudes of the public, towards smoke-free policies in outdoor areas. A vast majority of the public supports restricting smoking in various outdoor settings. The respondents reasons for supporting the policies were for varying reasons such as, litter control, establishing positive smoke-free role models for youth, reducing youth opportunities to smoke, and avoiding exposure to secondhand smoke. Alternatives to smoke-free laws have also been proposed as a means of harm reduction, particularly in bars and restaurants. For example, critics of smoke-free laws cite studies suggesting ventilation as a means of reducing tobacco smoke pollutants and improving air quality. Ventilation has also been heavily promoted by the tobacco industry as an alternative to outright bans, via a network of ostensibly independent experts with often undisclosed ties to the industry. However, not all critics have connections to the industry. The American Society of Heating, Refrigerating and Air-Conditioning Engineers (ASHRAE) officially concluded in 2005 that while completely isolated smoking rooms do eliminate the risk to nearby non-smoking areas, smoking bans are the only means of completely eliminating health risks associated with indoor exposure. They further concluded that no system of dilution or cleaning was effective at eliminating risk. The U.S. Surgeon General and the European Commission Joint Research Centre have reached similar conclusions. The implementation guidelines for the WHO Framework Convention on Tobacco Control states that engineering approaches, such as ventilation, are ineffective and do not protect against second-hand smoke exposure. However, this does not necessarily mean that such measures are useless in reducing harm, only that they fall short of the goal of reducing exposure completely to zero. Others have suggested a system of tradable smoking pollution permits, similar to the cap-and-trade pollution permits systems used by the Environmental Protection Agency in recent decades to curb other types of pollution. This would guarantee that a portion of bars/restaurants in a jurisdiction will be smoke-free, while leaving the decision to the market. Multiple studies have been conducted to determine the carcinogenicity of environmental tobacco smoke to animals. These studies typically fall under the categories of simulated environmental tobacco smoke, administering condensates of sidestream smoke, or observational studies of cancer among pets. To simulate environmental tobacco smoke, scientists expose animals to sidestream smoke, that which emanates from the cigarette's burning cone and through its paper, or a combination of mainstream and sidestream smoke. The IARC monographs conclude that mice with prolonged exposure to simulated environmental tobacco smoke, that is 6hrs a day, 5 days a week, for five months with a subsequent 4 month interval before dissection, will have significantly higher incidence and multiplicity of lung tumors than with control groups. The IARC monographs concluded that sidestream smoke condensates had a significantly higher carcinogenic effect on mice than did mainstream smoke condensates. Second-hand smoke is popularly recognised as a risk factor for cancer in pets. A study conducted by the Tufts University School of Veterinary Medicine and the University of Massachusetts Amherst linked the occurrence of feline oral cancer to exposure to environmental tobacco smoke through an overexpression of the p53 gene. Another study conducted at the same universities concluded that cats living with a smoker were more likely to get feline lymphoma; the risk increased with the duration of exposure to secondhand smoke and the number of smokers in the household. A study by Colorado State University researchers, looking at cases of canine lung cancer, was generally inconclusive, though the authors reported a weak relation for lung cancer in dogs exposed to environmental tobacco smoke. The number of smokers within the home, the number of packs smoked in the home per day, and the amount of time that the dog spent within the home had no effect on the dog's risk for lung cancer. As of 2003, "secondhand smoke" was the term most used to refer to other people's smoke in the English-language media. Other terms used include "environmental tobacco smoke", while "involuntary smoking" and "passive smoking" are used to refer to exposure to secondhand smoke. The term "environmental tobacco smoke" can be traced back to a 1974 industry-sponsored meeting held in Bermuda, while the term "passive smoking" was first used in the title of a scientific paper in 1970. The Surgeon General of the United States prefers to use the phrase "secondhand smoke" rather than "environmental tobacco smoke", stating that "The descriptor "secondhand" captures the involuntary nature of the exposure, while "environmental" does not. ":9 Most researchers consider the term "passive smoking" to be synonymous with "secondhand smoke". In contrast, a 2011 commentary in Environmental Health Perspectives argued that research into "thirdhand smoke" renders it inappropriate to refer to passive smoking with the term "secondhand smoke", which the authors stated constitutes a pars pro toto. ^ a b c d e f g h i j k IARC 2004 "There is sufficient evidence that involuntary smoking (exposure to secondhand or 'environmental' tobacco smoke) causes lung cancer in humans"
^ Samet JM (2008). "Secondhand smoke: facts and lies". Salud Pública de México. 50 (5): 428–34. doi:10.1590/S0036-36342008000500016. PMID 18852940. ^ a b c d Tong, EK; Glantz, SA (2007-10-16). "Tobacco industry efforts undermining evidence linking secondhand smoke with cardiovascular disease". Circulation. 116 (16): 1845–54. doi:10.1161/CIRCULATIONAHA.107.715888. PMID 17938301. ^ "CDC - Fact Sheet - Smoke-Free Policies Reduce Smoking - Smoking & Tobacco Use". Smoking and Tobacco Use. Retrieved 2015-04-24. ^ a b c d e "Proposed Identification of Environmental Tobacco Smoke as a Toxic Air Contaminant". California Environmental Protection Agency. 2005-06-24. Retrieved 2009-01-12. ^ Alberg, Anthony J.; Brock, Malcolm V.; Ford, Jean G.; Samet, Jonathan M.; Spivack, Simon D. (1 May 2013). "Epidemiology of Lung Cancer". Chest. 143 (5_suppl): e1S–e29S. doi:10.1378/chest.12-2345. PMC 4694610. PMID 23649439. ^ Bhatnagar, A; Whitsel, LP; Ribisl, KM; Bullen, C; Chaloupka, F; Piano, MR; Robertson, RM; McAuley, T; Goff, D; Benowitz, N; American Heart Association Advocacy Coordinating Committee, Council on Cardiovascular and Stroke Nursing, Council on Clinical Cardiology, and Council on Quality of Care and Outcomes, Research (14 October 2014). "Electronic cigarettes: a policy statement from the American Heart Association". Circulation. 130 (16): 1418–36. doi:10.1161/CIR.0000000000000107. PMID 25156991. ^ "Health Effects of Secondhand Smoke". November 24, 2014. Retrieved 30 May 2015. ^ Macacu, A; Autier, P; Boniol, M; Boyle, P (November 2015). "Active and passive smoking and risk of breast cancer: a meta-analysis". Breast Cancer Research and Treatment. 154 (2): 213–24. doi:10.1007/s10549-015-3628-4. PMID 26546245. ^ Zhou, J; Wellenius, GA; Michaud, DS (December 2012). "Environmental tobacco smoke and the risk of pancreatic cancer among non-smokers: a meta-analysis". Occupational and Environmental Medicine. 69 (12): 853–7. doi:10.1136/oemed-2012-100844. PMID 22843437. ^ a b c Cao, S; Yang, C; Gan, Y; Lu, Z (2015). "The Health Effects of Passive Smoking: An Overview of Systematic Reviews Based on Observational Epidemiological Evidence". PLoS One. 10 (10): e0139907. Bibcode:2015PLoSO..1039907C. doi:10.1371/journal.pone.0139907. PMC 4595077. PMID 26440943. ^ Cumberbatch, Marcus G.; Rota, Matteo; Catto, James W.F. ; La Vecchia, Carlo (September 2016). "The Role of Tobacco Smoke in Bladder and Kidney Carcinogenesis: A Comparison of Exposures and Meta-analysis of Incidence and Mortality Risks". European Urology. 70 (3): 458–466. doi:10.1016/j.eururo.2015.06.042. PMID 26149669. ^ Lv, X; Sun, J; Bi, Y; Xu, M; Lu, J; Zhao, L; Xu, Y (15 November 2015). "Risk of all-cause mortality and cardiovascular disease associated with secondhand smoke exposure: a systematic review and meta-analysis". International Journal of Cardiology. 199: 106–15. doi:10.1016/j.ijcard.2015.07.011. PMID 26188829. ^ Dinas, PC; Koutedakis, Y; Flouris, AD (20 February 2013). "Effects of active and passive tobacco cigarette smoking on heart rate variability". International Journal of Cardiology. 163 (2): 109–15. doi:10.1016/j.ijcard.2011.10.140. PMID 22100604. ^ Zou N, Hong J, Dai QY (February 2009). "Passive cigarette smoking induces inflammatory injury in human arterial walls". Chin. Med. J. 122 (4): 444–8. PMID 19302752. ^ Oono, I. P.; Mackay, D. F.; Pell, J. P. (21 March 2011). "Meta-analysis of the association between secondhand smoke exposure and stroke". Journal of Public Health. 33 (4): 496–502. doi:10.1093/pubmed/fdr025. PMID 21422014. ^ Bentayeb, M; Simoni, M; Norback, D; Baldacci, S; Maio, S; Viegi, G; Annesi-Maesano, I (2013). "Indoor air pollution and respiratory health in the elderly". Journal of Environmental Science and Health, Part A. 48 (14): 1783–9. doi:10.1080/10934529.2013.826052. PMID 24007433. ^ Dogar, OF; Pillai, N; Safdar, N; Shah, SK; Zahid, R; Siddiqi, K (November 2015). "Second-hand smoke and the risk of tuberculosis: a systematic review and a meta-analysis". Epidemiology and Infection. 143 (15): 3158–72. doi:10.1017/S0950268815001235. PMID 26118887. ^ Hur, Kevin; Liang, Jonathan; Lin, Sandra Y. (January 2014). "The role of secondhand smoke in sinusitis: a systematic review". International Forum of Allergy & Rhinology. 4 (1): 22–28. doi:10.1002/alr.21232. PMID 24574074. ^ Chen, R; Hu, Z; Orton, S; Chen, RL; Wei, L (December 2013). "Association of passive smoking with cognitive impairment in nonsmoking older adults: a systematic literature review and a new study of Chinese cohort". Journal of Geriatric Psychiatry and Neurology. 26 (4): 199–208. doi:10.1177/0891988713496165. PMID 23877565. ^ Ling, Jonathan; Heffernan, Thomas (2016). "The Cognitive Deficits Associated with Second-Hand Smoking". Frontiers in Psychiatry. 7: 46. doi:10.3389/fpsyt.2016.00046. ISSN 1664-0640. PMC 4805605. PMID 27047401. This article incorporates text by Jonathan Ling and Thomas Heffernan available under the CC BY 4.0 license. ^ Zeng, Yan-Ni; Li, Ya-Min (10 December 2015). "Secondhand smoke exposure and mental health in adults: a meta-analysis of cross-sectional studies". Social Psychiatry and Psychiatric Epidemiology. 51 (9): 1339–48. doi:10.1007/s00127-015-1164-5. PMID 26661619. ^ Cui, H; Gong, TT; Liu, CX; Wu, QJ (25 January 2016). "Associations between Passive Maternal Smoking during Pregnancy and Preterm Birth: Evidence from a Meta-Analysis of Observational Studies". PLOS ONE. 11 (1): e0147848. Bibcode:2016PLoSO..1147848C. doi:10.1371/journal.pone.0147848. PMC 4726502. PMID 26808045. ^ Been, Jasper; Nurmatov, U. B.; Cox, B; Nawrot, T. S.; Van Schayck, C. P.; Sheikh, A (28 March 2014). "Effect of smoke-free legislation on perinatal and child health: a systematic review and meta-analysis". Lancet. 383 (9928): 1549–60. doi:10.1016/S0140-6736(14)60082-9. PMID 24680633. ^ Leonardi-Bee, J; Britton, J; Venn, A (April 2011). "Secondhand smoke and adverse fetal outcomes in nonsmoking pregnant women: a meta-analysis". Pediatrics. 127 (4): 734–41. doi:10.1542/peds.2010-3041. PMID 21382949. ^ Salmasi G, Grady R, Jones J, McDonald SD (2010). "Environmental tobacco smoke exposure and perinatal outcomes: a systematic review and meta-analyses". Acta Obstet Gynecol Scand. 89 (4): 423–41. doi:10.3109/00016340903505748. PMID 20085532. ^ Janson C (2004). "The effect of passive smoking on respiratory health in children and adults". Int J Tuberc Lung Dis. 8 (5): 510–6. PMID 15137524. ^ Saulyte, Jurgita; Regueira, Carlos; Montes-Martínez, Agustín; Khudyakov, Polyna; Takkouche, Bahi; Novotny, Thomas E. (11 March 2014). "Active or Passive Exposure to Tobacco Smoking and Allergic Rhinitis, Allergic Dermatitis, and Food Allergy in Adults and Children: A Systematic Review and Meta-Analysis". PLoS Medicine. 11 (3): e1001611. doi:10.1371/journal.pmed.1001611. PMC 3949681. PMID 24618794. ^ Wei, X; E, M; Yu, S (January 2015). "A meta-analysis of passive smoking and risk of developing Type 2 Diabetes Mellitus". Diabetes Research and Clinical Practice. 107 (1): 9–14. doi:10.1016/j.diabres.2014.09.019. PMID 25488377. ^ Wang, Y; Ji, J; Liu, YJ; Deng, X; He, QQ (2013). "Passive smoking and risk of type 2 diabetes: a meta-analysis of prospective cohort studies". PLoS ONE. 8 (7): e69915. Bibcode:2013PLoSO...869915W. doi:10.1371/journal.pone.0069915. PMC 3724674. PMID 23922856. ^ Sun, K; Liu, D; Wang, C; Ren, M; Yang, C; Yan, L (November 2014). "Passive smoke exposure and risk of diabetes: a meta-analysis of prospective studies". Endocrine. 47 (2): 421–7. doi:10.1007/s12020-014-0194-1. PMID 24532101. ^ Pan, An; Wang, Yeli; Talaei, Mohammad; Hu, Frank B; Wu, Tangchun (December 2015). "Relation of active, passive, and quitting smoking with incident type 2 diabetes: a systematic review and meta-analysis". The Lancet Diabetes & Endocrinology. 3 (12): 958–967. doi:10.1016/S2213-8587(15)00316-2. PMC 4656094. PMID 26388413. ^ Akinkugbe, Aderonke A.; Slade, Gary D.; Divaris, Kimon; Poole, Charles (November 2016). "Systematic Review and Meta-analysis of the Association Between Exposure to Environmental Tobacco Smoke and Periodontitis Endpoints Among Nonsmokers". Nicotine & Tobacco Research. 18 (11): 2047–56. doi:10.1093/ntr/ntw105. PMC 5055738. PMID 27083214. ^ Glantz SA, Parmley WW (1991). "Passive smoking and heart disease. Epidemiology, physiology, and biochemistry". Circulation. 83 (1): 1–12. doi:10.1161/01.cir.83.1.1. PMID 1984876. ^ Taylor AE, Johnson DC, Kazemi H (1992). "Environmental tobacco smoke and cardiovascular disease. A position paper from the Council on Cardiopulmonary and Critical Care, American Heart Association". Circulation. 86 (2): 699–702. doi:10.1161/01.cir.86.2.699. PMID 1638735. ^ "Second-hand smoke". WHO website. Retrieved 24 April 2015. ^ "The last gasp". The Economist. 19 July 2017. Retrieved 20 July 2017. ^ Kantor, R; Kim, A; Thyssen, JP; Silverberg, JI (December 2016). "Association of atopic dermatitis with smoking: A systematic review and meta-analysis". Journal of the American Academy of Dermatology. 75 (6): 1119–1125.e1. doi:10.1016/j.jaad.2016.07.017. PMC 5216172. PMID 27542586. ^ Anderson, HR; Cook, DG (November 1997). "Passive smoking and sudden infant death syndrome: review of the epidemiological evidence". Thorax. 52 (11): 1003–9. doi:10.1136/thx.52.11.1003. PMC 1758452. PMID 9487351. ^ a b "Secondhand Smoke and Children Fact Sheet", American Lung Association August 2006. ^ Vork KL, Broadwin RL, Blaisdell RJ (2007). "Developing Asthma in Childhood from Exposure to Secondhand Tobacco Smoke: Insights from a Meta-Regression". Environ. Health Perspect. 115 (10): 1394–400. doi:10.1289/ehp.10155. PMC 2022647. PMID 17938726. ^ Tinuoye, O.; Pell, J. P.; Mackay, D. F. (28 March 2013). "Meta-Analysis of the Association Between Secondhand Smoke Exposure and Physician-Diagnosed Childhood Asthma". Nicotine & Tobacco Research. 15 (9): 1475–1483. doi:10.1093/ntr/ntt033. PMID 23539174. ^ Wang, Zhen; May, Sara M.; Charoenlap, Suvanee; Pyle, Regan; Ott, Nancy L.; Mohammed, Khaled; Joshi, Avni Y. (November 2015). "Effects of secondhand smoke exposure on asthma morbidity and health care utilization in children: a systematic review and meta-analysis". Annals of Allergy, Asthma & Immunology. 115 (5): 396–401.e2. doi:10.1016/j.anai.2015.08.005. PMID 26411971. ^ de Jongste JC, Shields MD (2003). "Cough • 2: Chronic cough in children". Thorax. 58 (11): 998–1003. doi:10.1136/thorax.58.11.998. PMC 1746521. PMID 14586058. ^ Dybing E, Sanner T (1999). "Passive smoking, sudden infant death syndrome (SIDS) and childhood infections". Hum Exp Toxicol. 18 (4): 202–5. doi:10.1191/096032799678839914. PMID 10333302. ^ a b c DiFranza JR, Aligne CA, Weitzman M (2004). "Prenatal and postnatal environmental tobacco smoke exposure and children's health". Pediatrics. 113 (4 Suppl): 1007–15. doi:10.1542/peds.113.4.S1.1007 (inactive 2019-03-16). PMID 15060193. ^ a b Chatzimichael A, Tsalkidis A, Cassimos D, et al. (2007). "The role of breastfeeding and passive smoking on the development of severe bronchiolitis in infants". Minerva Pediatr. 59 (3): 199–206. PMID 17519864. ^ a b Preventing Smoking and Exposure to Secondhand Smoke Before, During, and After Pregnancy Archived 2011-09-11 at the Wayback Machine. Centers for Disease Control and Prevention. July 2007. ^ Jafta, N; Jeena, PM; Barregard, L; Naidoo, RN (May 2015). "Childhood tuberculosis and exposure to indoor air pollution: a systematic review and meta-analysis". The International Journal of Tuberculosis and Lung Disease. 19 (5): 596–602. doi:10.5588/ijtld.14.0686. PMID 25868030. ^ Feleszko, W; Ruszczyński, M; Jaworska, J; Strzelak, A; Zalewski, BM; Kulus, M (November 2014). "Environmental tobacco smoke exposure and risk of allergic sensitisation in children: a systematic review and meta-analysis". Archives of Disease in Childhood. 99 (11): 985–92. doi:10.1136/archdischild-2013-305444. PMID 24958794. ^ Sabbagh, HJ; Hassan, MH; Innes, NP; Elkodary, HM; Little, J; Mossey, PA (2015). "Passive smoking in the etiology of non-syndromic orofacial clefts: a systematic review and meta-analysis". PLoS ONE. 10 (3): e0116963. Bibcode:2015PLoSO..1016963S. doi:10.1371/journal.pone.0116963. PMC 4356514. PMID 25760440. ^ Jones, DT; Osterman, MT; Bewtra, M; Lewis, JD (September 2008). "Passive smoking and inflammatory bowel disease: a meta-analysis". The American Journal of Gastroenterology. 103 (9): 2382–93. doi:10.1111/j.1572-0241.2008.01999.x. PMC 2714986. PMID 18844625. ^ Pagani, Linda S. (July 2014). "Environmental tobacco smoke exposure and brain development: The case of attention deficit/hyperactivity disorder". Neuroscience & Biobehavioral Reviews. 44: 195–205. doi:10.1016/j.neubiorev.2013.03.008. PMID 23545330. ^ "Scientific Consensus Statement on Environmental Agents Associated with Neurodevelopmental Disorders" (PDF). The Collaborative on Health and the Environment's Learning and Developmental Disabilities Initiative. July 1, 2008. Archived from the original (PDF) on 2009-03-27. ^ Chen, R; Clifford, A; Lang, L; Anstey, KJ (October 2013). "Is exposure to secondhand smoke associated with cognitive parameters of children and adolescents?—a systematic literature review". Annals of Epidemiology. 23 (10): 652–61. doi:10.1016/j.annepidem.2013.07.001. PMID 23969303. ^ Avşar A, Darka O, Topaloğlu B, Bek Y (October 2008). "Association of passive smoking with caries and related salivary biomarkers in young children". Arch. Oral Biol. 53 (10): 969–74. doi:10.1016/j.archoralbio.2008.05.007. PMID 18672230. ^ Jones, Laura L. (1 January 2012). "Parental Smoking and the Risk of Middle Ear Disease in Children". Archives of Pediatrics & Adolescent Medicine. 166 (1): 18–27. doi:10.1001/archpediatrics.2011.158. PMID 21893640. ^ Lee, Chien-Chang; Middaugh, Nicole A.; Howie, Stephen R. C.; Ezzati, Majid; Lanphear, Bruce P. (7 December 2010). "Association of Secondhand Smoke Exposure with Pediatric Invasive Bacterial Disease and Bacterial Carriage: A Systematic Review and Meta-analysis". PLoS Medicine. 7 (12): e1000374. doi:10.1371/journal.pmed.1000374. PMC 2998445. PMID 21151890. ^ Wang, Meng; Wang, Zhi-Ping; Zhang, Meng; Zhao, Zhong-Tang (13 August 2013). "Maternal passive smoking during pregnancy and neural tube defects in offspring: a meta-analysis". Archives of Gynecology and Obstetrics. 289 (3): 513–521. doi:10.1007/s00404-013-2997-3. PMID 23942772. ^ Pineles, B. L.; Park, E.; Samet, J. M. (10 February 2014). "Systematic Review and Meta-Analysis of Miscarriage and Maternal Exposure to Tobacco Smoke During Pregnancy". American Journal of Epidemiology. 179 (7): 807–823. doi:10.1093/aje/kwt334. PMC 3969532. PMID 24518810. ^ Chiswell, C; Akram, Y (February 2017). "Impact of environmental tobacco smoke exposure on anaesthetic and surgical outcomes in children: a systematic review and meta-analysis". Archives of Disease in Childhood. 102 (2): 123–130. doi:10.1136/archdischild-2016-310687. PMC 5284464. PMID 27417307. ^ Jara, SM; Benke, JR; Lin, SY; Ishman, SL (January 2015). "The association between secondhand smoke and sleep-disordered breathing in children: a systematic review". The Laryngoscope. 125 (1): 241–7. doi:10.1002/lary.24833. PMID 25130300. ^ Raghuveer, Geetha; White, David A.; Hayman, Laura L.; Woo, Jessica G.; Villafane, Juan; Celermajer, David; Ward, Kenneth D.; de Ferranti, Sarah D.; Zachariah, Justin (18 October 2016). "Cardiovascular Consequences of Childhood Secondhand Tobacco Smoke Exposure: Prevailing Evidence, Burden, and Racial and Socioeconomic Disparities: A Scientific Statement From the American Heart Association". Circulation. 134 (16): e336–59. doi:10.1161/CIR.0000000000000443. PMC 5207215. PMID 27619923. ^ Wells, AJ (July 1998). "Lung cancer from passive smoking at work". American Journal of Public Health. 88 (7): 1025–9. doi:10.2105/ajph.88.7.1025. PMC 1508269. PMID 9663148. ^ Stayner, L; Bena, J; Sasco, AJ; Smith, R; Steenland, K; Kreuzer, M; Straif, K (March 2007). "Lung cancer risk and workplace exposure to environmental tobacco smoke". American Journal of Public Health. 97 (3): 545–51. doi:10.2105/AJPH.2004.061275. PMC 1805004. PMID 17267733. ^ Steenland K (January 1992). "Passive smoking and the risk of heart disease". JAMA. 267 (1): 94–9. doi:10.1001/jama.267.1.94. PMID 1727204. ^ Law, MR; Morris, JK; Wald, NJ (18 October 1997). "Environmental tobacco smoke exposure and ischaemic heart disease: an evaluation of the evidence". BMJ (Clinical Research Ed.). 315 (7114): 973–80. doi:10.1136/bmj.315.7114.973. PMC 2127675. PMID 9365294. ^ Thun, M; Henley, J; Apicella, L (December 1999). "Epidemiologic studies of fatal and nonfatal cardiovascular disease and ETS exposure from spousal smoking". Environmental Health Perspectives. 107 Suppl 6: 841–6. doi:10.2307/3434563. JSTOR 3434563. PMC 1566204. PMID 10592140. ^ He, J; Vupputuri, S; Allen, K; Prerost, MR; Hughes, J; Whelton, PK (25 March 1999). "Passive smoking and the risk of coronary heart disease—a meta-analysis of epidemiologic studies". The New England Journal of Medicine. 340 (12): 920–6. doi:10.1056/nejm199903253401204. PMID 10089185. ^ Diethelm PA, Rielle JC, McKee M (2005). "The whole truth and nothing but the truth? The research that Philip Morris did not want you to see". Lancet. 366 (9479): 86–92. doi:10.1016/S0140-6736(05)66474-4. PMID 15993237. ^ Schick S, Glantz S (2005). "Philip Morris toxicological experiments with fresh sidestream smoke: more toxic than mainstream smoke". Tobacco Control. 14 (6): 396–404. doi:10.1136/tc.2005.011288. PMC 1748121. PMID 16319363. ^ Schick S, Glantz SA (2006). "Sidestream cigarette smoke toxicity increases with aging and exposure duration". Tobacco Control. 15 (6): 424–9. doi:10.1136/tc.2006.016162. PMC 2563675. PMID 17130369. ^ Schick SF, Glantz S (2007). "Concentrations of the carcinogen 4-(methylnitrosamino)-1-(3-pyridyl)-1-butanone in sidestream cigarette smoke increase after release into indoor air: results from unpublished tobacco industry research". Cancer Epidemiol. Biomarkers Prev. 16 (8): 1547–53. doi:10.1158/1055-9965.EPI-07-0210. PMID 17684127. ^ Gaia Vince (2004-06-30). "Passive smoking danger was underestimated". New Scientist. Retrieved 2007-07-24. ^ Hackshaw, AK; Law, MR; Wald, NJ (18 October 1997). "The accumulated evidence on lung cancer and environmental tobacco smoke". BMJ (Clinical Research Ed.). 315 (7114): 980–8. doi:10.1136/bmj.315.7114.980. PMC 2127653. PMID 9365295. ^ Copas, J B (12 February 2000). "Reanalysis of epidemiological evidence on lung cancer and passive smoking". BMJ. 320 (7232): 417–418. doi:10.1136/bmj.320.7232.417. ^ Takagi, H; Sekino, S; Kato, T; Matsuno, Y; Umemoto, T (February 2006). "Revisiting evidence on lung cancer and passive smoking: adjustment for publication bias by means of "trim and fill" algorithm". Lung Cancer (Amsterdam, Netherlands). 51 (2): 245–6. doi:10.1016/j.lungcan.2005.11.004. PMID 16386820. ^ Zhong, L; Goldberg, MS; Parent, ME; Hanley, JA (January 2000). "Exposure to environmental tobacco smoke and the risk of lung cancer: a meta-analysis". Lung Cancer (Amsterdam, Netherlands). 27 (1): 3–18. doi:10.1016/S0169-5002(99)00093-8. PMID 10672779. ^ Taylor, Richard; Gumming, Robert; Woodward, Alistair; Black, Megan (June 2001). "Passive smoking and lung cancer: a cumulative meta-analysis". Australian and New Zealand Journal of Public Health. 25 (3): 203–211. doi:10.1111/j.1467-842X.2001.tb00564.x. PMID 11494987. ^ Kim, CH; Lee, YC; Hung, RJ; McNallan, SR; Cote, ML; Lim, WY; Chang, SC; Kim, JH; Ugolini, D; Chen, Y; Liloglou, T; Andrew, AS; Onega, T; Duell, EJ; Field, JK; Lazarus, P; Le Marchand, L; Neri, M; Vineis, P; Kiyohara, C; Hong, YC; Morgenstern, H; Matsuo, K; Tajima, K; Christiani, DC; McLaughlin, JR; Bencko, V; Holcatova, I; Boffetta, P; Brennan, P; Fabianova, E; Foretova, L; Janout, V; Lissowska, J; Mates, D; Rudnai, P; Szeszenia-Dabrowska, N; Mukeria, A; Zaridze, D; Seow, A; Schwartz, AG; Yang, P; Zhang, ZF (15 October 2014). "Exposure to secondhand tobacco smoke and lung cancer by histological type: a pooled analysis of the International Lung Cancer Consortium (ILCCO)". International Journal of Cancer. 135 (8): 1918–30. doi:10.1002/ijc.28835. PMC 4126868. PMID 24615328. ^ a b Novak K (2007). "Passive smoking: out from the haze". Nature. 447 (7148): 1049–51. Bibcode:2007Natur.447.1049N. doi:10.1038/4471049a. PMID 17597735. ^ Bailar J (1999). "Passive Smoking, Coronary Heart Disease, and Meta-Analysis (Editorial)". The New England Journal of Medicine. 340 (12): 958–9. doi:10.1056/NEJM199903253401211. PMID 10089192. ^ Raupach T, Schäfer K, Konstantinides S, Andreas S (2006). "Secondhand smoke as an acute threat for the cardiovascular system: a change in paradigm". European Heart Journal. 27 (4): 386–392. doi:10.1093/eurheartj/ehi601. PMID 16230308. ^ Taylor R, Najafi F, Dobson A (October 2007). "Meta-analysis of studies of passive smoking and lung cancer: effects of study type and continent". Int J Epidemiol. 36 (5): 1048–59. doi:10.1093/ije/dym158. PMID 17690135. ^ Stayner L, Bena J, Sasco AJ, et al. (2007). "Lung Cancer Risk and Workplace Exposure to Environmental Tobacco Smoke". Am J Public Health. 97 (3): 545–51. doi:10.2105/AJPH.2004.061275. PMC 1805004. PMID 17267733. ^ "Health effects of indoor air pollution". Archived from the original on 2006-08-05. Retrieved 2006-07-26. ^ Wirth N, Abou-Hamdan K, Spinosa A, Bohadana A, Martinet Y (February 2005). "[Passive smoking]". Rev Pneumol Clin (in French). 61 (1 Pt 1): 7–15. doi:10.1016/s0761-8417(05)84776-5. PMID 15772574. ^ a b "France to ban smoking in public". BBC. 2006-10-08. Retrieved 2006-10-09. ^ Meyers, DG; Neuberger, JS; He, J (29 September 2009). "Cardiovascular effect of bans on smoking in public places: a systematic review and meta-analysis". Journal of the American College of Cardiology. 54 (14): 1249–55. doi:10.1016/j.jacc.2009.07.022. PMID 19778665. ^ Lin, H; Wang, H; Wu, W; Lang, L; Wang, Q; Tian, L (31 May 2013). "The effects of smoke-free legislation on acute myocardial infarction: a systematic review and meta-analysis". BMC Public Health. 13: 529. doi:10.1186/1471-2458-13-529. PMC 3671962. PMID 23721370. ^ a b Fitzsimmons, Kathleen (21 November 2013). "Reducing Worker Exposure to ETS". National Institute for Occupational Safety and Health (NIOSH). Retrieved 14 January 2015. ^ Office on Smoking Health (US) (2006). The Health Consequences of Involuntary Exposure to Tobacco Smoke: A Report of the Surgeon General. Publications and Reports of the Surgeon General. Centers for Disease Control and Prevention (US). PMID 20669524. Retrieved 2015-04-24. ^ Alberg, Anthony J.; Brock, Malcolm V.; Ford, Jean G.; Samet, Jonathan M.; Spivack, Simon D. (May 2013). "Epidemiology of lung cancer: Diagnosis and management of lung cancer, 3rd ed: American College of Chest Physicians evidence-based clinical practice guidelines". Chest. 143 (5 Suppl): e1S–e29S. doi:10.1378/chest.12-2345. ISSN 1931-3543. PMC 4694610. PMID 23649439. ^ Song, Anna V.; Glantz, Stanton A.; Halpern-Felsher, Bonnie L. (December 2009). "Perceptions of Second-hand Smoke Risks Predict Future Adolescent Smoking Initiation". Journal of Adolescent Health. 45 (6): 618–625. doi:10.1016/j.jadohealth.2009.04.022. ISSN 1054-139X. PMC 2814413. PMID 19931835. ^ a b Metz-Favre C, Donnay C, de Blay F (February 2005). "[Markers of environmental tobacco smoke (ETS) exposure]". Rev Mal Respir (in French). 22 (1 Pt 1): 81–92. doi:10.1016/S0761-8425(05)85439-7. PMID 15968761. ^ McClure JB (April 2002). "Are biomarkers useful treatment aids for promoting health behavior change? An empirical review". Am J Prev Med. 22 (3): 200–7. doi:10.1016/S0749-3797(01)00425-1. PMID 11897465. ^ Klesges RC, Debon M, Ray JW (October 1995). "Are self-reports of smoking rate biased? Evidence from the Second National Health and Nutrition Examination Survey". J Clin Epidemiol. 48 (10): 1225–33. doi:10.1016/0895-4356(95)00020-5. PMID 7561984. ^ Okoli CT, Kelly T, Hahn EJ (October 2007). "Secondhand smoke and nicotine exposure: a brief review". Addict Behav. 32 (10): 1977–88. doi:10.1016/j.addbeh.2006.12.024. PMID 17270359. ^ Florescu A, Ferrence R, Einarson T, Selby P, Soldin O, Koren G (February 2009). "Methods for quantification of exposure to cigarette smoking and environmental tobacco smoke: focus on developmental toxicology". Ther Drug Monit. 31 (1): 14–30. doi:10.1097/FTD.0b013e3181957a3b. PMC 3644554. PMID 19125149. ^ Irving JM, Clark EC, Crombie IK, Smith WC (January 1988). "Evaluation of a portable measure of expired-air carbon monoxide". Prev Med. 17 (1): 109–15. doi:10.1016/0091-7435(88)90076-X. PMID 3362796. ^ Schick S, Glantz S (2005). "Philip Morris toxicological experiments with fresh sidestream smoke: more toxic than mainstream smoke". Tob. Control. 14 (6): 396–404. doi:10.1136/tc.2005.011288. PMC 1748121. PMID 16319363. ^ Invernizzi G, Ruprecht A, Mazza R, et al. (2004). "Particulate matter from tobacco versus diesel car exhaust: an educational perspective". Tob Control. 13 (3): 219–21. doi:10.1136/tc.2003.005975. PMC 1747905. PMID 15333875. ^ Barnoya J, Glantz SA (2005). "Cardiovascular effects of secondhand smoke: nearly as large as smoking". Circulation. 111 (20): 2684–98. doi:10.1161/CIRCULATIONAHA.104.492215. PMID 15911719. ^ Otsuka R, Watanabe H, Hirata K, et al. (2001). "Acute effects of passive smoking on the coronary circulation in healthy young adults". JAMA. 286 (4): 436–41. doi:10.1001/jama.286.4.436. PMID 11466122. ^ Celermajer, David S.; Adams, Mark R.; Clarkson, Peter; Robinson, Jacqui; McCredie, Robyn; Donald, Ann; Deanfield, John E. (18 January 1996). "Passive Smoking and Impaired Endothelium-Dependent Arterial Dilatation in Healthy Young Adults". New England Journal of Medicine. 334 (3): 150–155. doi:10.1056/NEJM199601183340303. PMID 8531969. ^ Howard, G; Thun, MJ (December 1999). "Why is environmental tobacco smoke more strongly associated with coronary heart disease than expected? A review of potential biases and experimental data". Environmental Health Perspectives. 107 Suppl 6: 853–8. doi:10.2307/3434565. JSTOR 3434565. PMC 1566209. PMID 10592142. ^ Cendon, S.P. ; Battlehner, C.; Lorenzi; Filho, G.; Dohlnikoff, M.; Pereira, P.M.; Conceição, G.M.S. ; Beppu, O.S. ; Saldiva, P.H.N. (22 May 2005). "Pulmonary emphysema induced by passive smoking: an experimental study in rats". SciELO Brasil. 507184. Archived from the original on 2011-07-25. Retrieved 2008-10-13. ^ Eren, U.; Kum, S.; Sandikci, M.; Kara, E. (2006). "Effects of long-term passive smoking on the mast cells in rat lungs". Revue de Médecine Vétérinaire. 6: 319–322. ^ Matt GE, Quintana PJ, Hovell MF, et al. (March 2004). "Households contaminated by environmental tobacco smoke: sources of infant exposures". Tob Control. 13 (1): 29–37. doi:10.1136/tc.2003.003889. PMC 1747815. PMID 14985592. ^ Winickoff JP, Friebely J, Tanski SE, et al. (January 2009). "Beliefs about the health effects of "thirdhand" smoke and home smoking bans". Pediatrics. 123 (1): e74–9. doi:10.1542/peds.2008-2184. PMC 3784302. PMID 19117850. ^ Rabin, Roni Caryn (2009-01-02). "A New Cigarette Hazard: 'Third-Hand Smoke'". New York Times. Retrieved 2009-01-12. ^ Sleiman M, et al. (February 2010). "Formation of carcinogens indoors by surface-mediated reactions of nicotine with nitrous acid, leading to potential thirdhand smoke hazards" (PDF). Proc. Natl. Acad. Sci. U.S.A. 107 (15): 6576–81. Bibcode:2010PNAS..107.6576S. doi:10.1073/pnas.0912820107. PMC 2872399. PMID 20142504. ^ Samet JM, Avila-Tang E, Boffetta P, et al. (September 2009). "Lung cancer in never smokers: Clinical epidemiology and environmental risk factors". Clin. Cancer Res. 15 (18): 5626–45. doi:10.1158/1078-0432.CCR-09-0376. PMC 3170525. PMID 19755391. ^ "Environmental Tobacco Smoke" (PDF). 11th Report on Carcinogens. U.S. National Institutes of Health. Archived from the original (PDF) on 2008-07-16. Retrieved 2007-08-27. ^ "Secondhand Smoke Fact Sheet". U.S. Centers for Disease Control and Prevention. ^ "Health Effects of Exposure to Environmental Tobacco Smoke". U.S. National Cancer Institute. Archived from the original on 2007-09-05. Retrieved 2007-08-22. ^ "Health Effects of Exposure to Secondhand Smoke". United States Environmental Protection Agency. Retrieved 2007-09-24. ^ "The Truth about Secondhand Smoke". American Heart Association. Retrieved 2007-08-27. ^ "Secondhand Smoke Fact Sheet". American Lung Association. Archived from the original on 2007-09-18. Retrieved 2007-09-24. ^ "Secondhand Smoke". American Cancer Society. Archived from the original on 2007-09-14. Retrieved 2007-08-27. ^ "AMA: Surgeon General's secondhand smoke report a wake-up call to lawmakers" (Press release). American Medical Association. Retrieved 2007-08-27. ^ "Tobacco's Toll: Implications for the Pediatrician". American Academy of Pediatrics. Archived from the original on 2007-10-15. Retrieved 2007-10-02. ^ "National Response to Passive Smoking in Enclosed Public Places and Workplaces" (PDF). Australian National Public Health Partnership. November 2000. Archived from the original (PDF) on 2014-02-12. Retrieved 2007-09-11. A 1998 report of the SCOTH concluded that passive smoking was a cause of lung cancer, heart disease, and other health problems. A 2004 update by the SCOTH Archived 2012-02-06 at the Wayback Machine, reviewing new evidence published since the 1998 report, found that recent research had confirmed the initially reported link between passive smoking and health risks. ^ Saad, Lydia (25 July 2007). "More Smokers Feeling Harassed by Smoking Bans". Gallup. Retrieved 20 February 2015. ^ "Cato and the tobacco industry". Accessed 8 April 2011. ^ Nahan, Mike. The Australian, 10 April 2000, "The IPA sings its own song". ^ Shermer, Michael; MacKenzie, Debora; Littlemore, Richard; Giles, Jim; Fitzpatrick, Michael (15 May 2010). "State of Denial, a Special Report". New Scientist: 36–45. Retrieved 16 August 2010. ^ Diethelm, PA; McKee, M (2009). "Denialism: what is it and how should scientists respond?". European Journal of Public Health. 19 (1): 2–4. doi:10.1093/eurpub/ckn139. PMID 19158101. Lay summary. ^ Enstrom JE, Kabat GC (2003). "Environmental tobacco smoke and tobacco related mortality in a prospective study of Californians, 1960-98". BMJ. 326 (7398): 1057. doi:10.1136/bmj.326.7398.1057. PMC 155687. PMID 12750205. ^ Davey Smith G (2003). "Effect of passive smoking on health: More information is available, but the controversy still persists". BMJ. 326 (7398): 1048–9. doi:10.1136/bmj.326.7398.1048. PMC 1125974. PMID 12750182. ^ Tong EK, Glantz SA (2007). "Tobacco industry efforts undermining evidence linking secondhand smoke with cardiovascular disease". Circulation. 116 (16): 1845–54. doi:10.1161/CIRCULATIONAHA.107.715888. PMID 17938301. ^ "American Cancer Society Condemns Tobacco Industry Study for Inaccurate Use of Data" (PDF) (Press release). American Cancer Society. 2003-05-13. Retrieved 2007-08-29. ^ Thun MJ (2003). "More misleading science from the tobacco industry". BMJ. 327 (7418): E237–8. doi:10.1136/bmjusa.03070002. ^ "Proposed Research on the relationship of Low Levels of Active Smoking to Mortality: Letter from James Enstrom to Philip Morris Scientific Affairs office". 1997-01-01. Retrieved 2007-08-29. ^ Dalton R (March 2007). "Passive-smoking study faces review". Nature. 446 (7133): 242. Bibcode:2007Natur.446..242D. doi:10.1038/446242a. PMID 17361147. ^ Bero, LA; Glantz, S; Hong, MK (April 2005). "The limits of competing interest disclosures". Tobacco Control. 14 (2): 118–26. PMC 1748015. PMID 15791022. ^ Enstrom, JE; Kabat, GC (March 2006). "Environmental tobacco smoke and coronary heart disease mortality in the United States--a meta-analysis and critique". Inhalation Toxicology. 18 (3): 199–210. CiteSeerX 10.1.1.495.2191. doi:10.1080/08958370500434255. PMID 16399662. ^ ETS / IAQ SCIENTIFIC CONSULTANTS, from the Legacy Tobacco Documents Archive. Retrieved July 19, 2007. ^ Gori, Gio Batta (Spring 2007). "Stoking the Rigged Terror of Secondhand Smoke" (PDF). Regulation. 30 (1): 14–7. Archived from the original (PDF) on 2009-01-16. ^ Smoked Out: Pundit for Hire, by Paul D. Thacker. Published in The New Republic on January 26, 2006. Retrieved August 22, 2007. ^ Philip Morris budget for "Strategy and Social Responsibility", listing Milloy as a paid consultant. Retrieved August 22, 2007. ^ "Secondhand Joking", by Steven Milloy. Retrieved May 31, 2013. ^ Samet JM, Burke TA (2001). "Turning Science Into Junk: The Tobacco Industry and Passive Smoking". Am J Public Health. 91 (11): 1742–4. doi:10.2105/AJPH.91.11.1742. PMC 1446866. PMID 11684591. ^ Scientific Communications Through the Media[permanent dead link], from the Philip Morris document archive. Retrieved October 3, 2007. Also cited in Ong EK, Glantz SA (2001). "Constructing "Sound Science" and "Good Epidemiology": Tobacco, Lawyers, and Public Relations Firms". Am J Public Health. 91 (11): 1749–57. doi:10.2105/AJPH.91.11.1749. PMC 1446868. PMID 11684593. ^ a b Ong EK, Glantz SA (2001). "Constructing "Sound Science" and "Good Epidemiology": Tobacco, Lawyers, and Public Relations Firms". Am J Public Health. 91 (11): 1749–57. doi:10.2105/AJPH.91.11.1749. PMC 1446868. PMID 11684593. ^ Layard, MW (February 1995). "Ischemic heart disease and spousal smoking in the National Mortality Followback Survey". Regulatory Toxicology and Pharmacology. 21 (1): 180–3. doi:10.1006/rtph.1995.1022. PMID 7784629. ^ LeVois, ME; Layard, MW (February 1995). "Publication bias in the environmental tobacco smoke/coronary heart disease epidemiologic literature". Regulatory Toxicology and Pharmacology. 21 (1): 184–91. doi:10.1006/rtph.1995.1023. PMID 7784630. ^ Law, Malcolm R; Wald, Nicholas J (July 2003). "Environmental tobacco smoke and ischemic heart disease". Progress in Cardiovascular Diseases. 46 (1): 31–38. doi:10.1016/S0033-0620(03)00078-1. PMID 12920699. ^ a b Boffetta P, Agudo A, Ahrens W, et al. (1998). "Multicenter case-control study of exposure to environmental tobacco smoke and lung cancer in Europe". J. Natl. Cancer Inst. 90 (19): 1440–50. doi:10.1093/jnci/90.19.1440. PMID 9776409. ^ "Passive Smoking Doesn't Cause Cancer —Official". Archived from the original on 2007-10-13. ^ "Smokescreens – The World Health Organization is showing signs of allowing politics to get in the way of truth. The Economist March 14th, 1998" (PDF). Archived from the original (PDF) on 2007-11-29. ^ WHO Rejects smoking link with lung cancer. Zimbabwe Independent 1998, Oct 23. ^ No Link Between Passive Smoking and Lung Cancer. The Times 1998, March 9. ^ "Passive Smoking Does Cause Lung Cancer, Do Not Let Them Fool You". Archived from the original on February 8, 2007. ^ Blot WJ, McLaughlin JK (1998). "Passive smoking and lung cancer risk: what is the story now?". J. Natl. Cancer Inst. 90 (19): 1416–7. doi:10.1093/jnci/90.19.1416. PMID 9776401. ^ Ong EK, Glantz SA (2000). "Tobacco industry efforts subverting International Agency for Research on Cancer's second-hand smoke study". Lancet. 355 (9211): 1253–9. doi:10.1016/S0140-6736(00)02098-5. PMID 10770318. ^ "Tobacco Companies Strategies to Undermine Tobacco Control Activities at the World Health Organization" (PDF). Retrieved 2008-12-30. ^ US Environmental Protection Agency. "Respiratory health effects of passive smoking: Lung cancer and other disorders". ^ "Flue-Cured Tobacco Cooperative vs. EPA" (PDF). Archived from the original (PDF) on 2008-10-09. Retrieved 2008-12-30. ^ U.S. Department of Health; Human Services; National Toxicology Program, eds. (December 2–3, 1998). "Final Report on Carcinogens – Background Document for Environmental Tobacco Smoke". Meeting of the NTP Board of Scientific Counselors – Report on Carcinogens Subcommittee (PDF). Research Triangle Park, North Carolina. p. 24. Archived from the original (PDF) on 2007-11-29. ^ Thun MJ (2003). "Passive smoking: Tobacco industry publishes disinformation". BMJ. 327 (7413): 502–3, author reply 504–5. doi:10.1136/bmj.327.7413.502-c. PMC 188400. PMID 12946979. ^ a b Barnes DE, Bero LA (1998). "Why review articles on the health effects of passive smoking reach different conclusions". JAMA. 279 (19): 1566–70. doi:10.1001/jama.279.19.1566. PMID 9605902. ^ Tong EK, England L, Glantz SA (2005). "Changing conclusions on secondhand smoke in a sudden infant death syndrome review funded by the tobacco industry". Pediatrics. 115 (3): e356–66. doi:10.1542/peds.2004-1922. PMID 15741361. ^ "The Health Consequences of Involuntary Exposure to Tobacco Smoke" (PDF). Executive Summary. Surgeon General of the United States. 2006. p. 21. Retrieved 2009-01-28. ^ a b c "Minutes of a meeting of Philip Morris with British tobacco companies to discuss tobacco-industry strategy on passive smoking". Archived from the original on 2007-10-13. Retrieved 2007-08-27. ^ A Study of Public Attitudes toward Cigarette Smoking and the Tobacco Industry in 1978, produced for the Tobacco Institute and released under the terms of the Tobacco Master Settlement Agreement. ^ Smith EA, Malone RE (June 2007). "'We will speak as the smoker': the tobacco industry's smokers' rights groups". Eur J Public Health. 17 (3): 306–13. doi:10.1093/eurpub/ckl244. PMC 2794244. PMID 17065174. ^ Trotter L, Chapman S (2003). ""Conclusions about exposure to ETS and health that will be unhelpful to us"*: How the tobacco industry attempted to delay and discredit the 1997 Australian National Health and Medical Research Council report on passive smoking". Tob Control. 12 (Suppl 3:iii): 102–6. doi:10.1136/tc.12.suppl_3.iii102. PMC 1766130. PMID 14645955. ^ Garne D, Watson M, Chapman S, Byrne F (2005). "Environmental tobacco smoke research published in the journal Indoor and Built Environment and associations with the tobacco industry". Lancet. 365 (9461): 804–9. doi:10.1016/S0140-6736(05)17990-2. PMID 15733724. ^ a b "The Health Consequences of Involuntary Exposure to Tobacco Smoke" (PDF). Executive Summary. Surgeon General of the United States. 2006. Retrieved 2009-01-28. ^ a b "Guidelines on the Protection from Exposure to Secondhand Smoke" (PDF). Framework Convention for Tobacco Control. World Health Organization. 2007. Retrieved 2009-01-29. ^ Frazer, K; Callinan, JE; McHugh, J; van Baarsel, S; Clarke, A; Doherty, K; Kelleher, C (4 February 2016). "Legislative smoking bans for reducing harms from secondhand smoke exposure, smoking prevalence and tobacco consumption". The Cochrane Database of Systematic Reviews. 2: CD005992. doi:10.1002/14651858.CD005992.pub3. PMID 26842828. ^ Centers for Disease Control and Prevention (CDC) (January 2009). "Reduced hospitalizations for acute myocardial infarction after implementation of a smoke-free ordinance—City of Pueblo, Colorado, 2002–2006". MMWR Morb. Mortal. Wkly. Rep. 57 (51): 1373–7. PMID 19116606. ^ Frazer, K; McHugh, J; Callinan, JE; Kelleher, C (27 May 2016). "Impact of institutional smoking bans on reducing harms and secondhand smoke exposure". The Cochrane Database of Systematic Reviews (5): CD011856. doi:10.1002/14651858.CD011856.pub2. PMID 27230795. ^ Hopkins DP, Razi S, Leeks KD, Priya Kalra G, Chattopadhyay SK, Soler RE (2010). "Smokefree policies to reduce tobacco use. A systematic review". Am J Prev Med. 38 (2 Suppl): S275–89. doi:10.1016/j.amepre.2009.10.029. PMID 20117612. ^ Scollo M, Lal A, Hyland A, Glantz S (Mar 2003). "Review of the quality of studies on the economic effects of smoke-free policies on the hospitality industry". Tobacco Control. 12 (1): 13–20. doi:10.1136/tc.12.1.13. PMC 1759095. PMID 12612356. ^ Barnoya J, Arvizu M, Jones MR, Hernandez JC, Breysse PN, Navas-Acien A (November 2010). "Secondhand smoke exposure in bars and restaurants in Guatemala City: before and after smoking ban evaluation". Cancer Causes Control. 22 (1): 151–6. doi:10.1007/s10552-010-9673-8. PMID 21046446. ^ Thomson G, Wilson N, Edwards R (June 2009). "At the frontier of tobacco control: a brief review of public attitudes toward smoke-free outdoor places". Nicotine Tob. Res. 11 (6): 584–90. doi:10.1093/ntr/ntp046. PMID 19359392. ^ Geens, Andrew; Max Graham (March 2005). "No ifs or butts". Building Sustainable Design. Archived from the original on 2009-01-06. Retrieved 2009-01-28. ^ Drope J, Bialous SA, Glantz SA (March 2004). "Tobacco industry efforts to present ventilation as an alternative to smoke-free environments in North America". Tob Control. 13 (Suppl 1): i41–7. doi:10.1136/tc.2003.004101. PMC 1766145. PMID 14985616. The industry developed a network of ventilation 'experts' to promote its position that smoke-free environments were not necessary, often without disclosing the financial relationship between these experts and the industry. ^ "Environmental Tobacco Smoke: Position Document" (PDF). American Society of Heating, Refrigerating and Air-Conditioning Engineers. June 30, 2005. Archived from the original (PDF) on March 27, 2009. Retrieved 2009-01-28. ^ "Institute for Health and Consumer Protection Activity Report 2003" (PDF). European Commission Joint Research Centre. 2003. Archived from the original (PDF) on March 27, 2009. Retrieved 2009-01-28. ^ Haveman, Robert; John Mullahy (September 25, 2005). "Let Bars Buy, Sell Smoking Permits". Wisconsin State Journal. p. B2. Archived from the original on January 4, 2009. Retrieved 2009-01-28. ^ Thompson, Andrea (2007-08-31). "Secondhand Smoke Causes Cancer in Pets". LiveScience. Retrieved 2007-08-31. ^ Snyder LA, Bertone ER, Jakowski RM, Dooner MS, Jennings-Ritchie J, Moore AS (2004). "p53 expression and environmental tobacco smoke exposure in feline oral squamous cell carcinoma". Vet Pathol. 41 (3): 209–14. doi:10.1354/vp.41-3-209. PMID 15133168. ^ Bertone ER, Snyder LA, Moore AS (2002). "Environmental Tobacco Smoke and Risk of Malignant Lymphoma in Pet Cats". American Journal of Epidemiology. 156 (3): 268–273. doi:10.1093/aje/kwf044. PMID 12142262. ^ Reif JS, Dunn K, Ogilvie GK, Harris CK (1992). "Passive smoking and canine lung cancer risk". Am J Epidemiol. 135 (3): 234–9. doi:10.1093/oxfordjournals.aje.a116276. PMID 1546698. ^ a b Chapman, S. (1 June 2003). "Other people's smoke: what's in a name?". Tobacco Control. 12 (2): 113–4. doi:10.1136/tc.12.2.113. PMC 1747703. PMID 12773710. ^ "Health Effects of Exposure to Secondhand Smoke". EPA. Retrieved 6 September 2015. ^ a b Protano, Carmela; Vitali, Matteo (1 October 2011). "The New Danger of Thirdhand Smoke: Why Passive Smoking Does Not Stop at Secondhand Smoke". Environmental Health Perspectives. 119 (10): a422. doi:10.1289/ehp.1103956. PMC 3230455. PMID 21968336. World Health Organization; International Agency for Research on Cancer (2004). Tobacco Smoke and Involuntary Smoking (PDF). IARC monographs on the evaluation of carcinogenic risks to humans. 83. Lyon, France: IARC Working Group on the Evaluation of Carcinogenic Risks to Humans. ISBN 978-92-832-1283-6. Öberg, Mattias; Jaakkola, Maritta S; Woodward, Alistair; Peruga, Armando; Prüss-Ustün, Annette (January 2011). "Worldwide burden of disease from exposure to second-hand smoke: a retrospective analysis of data from 192 countries". The Lancet. 377 (9760): 139–146. doi:10.1016/s0140-6736(10)61388-8. ISSN 0140-6736. PMID 21112082. Kessler, Gladys (August 17, 2006). "United States of America v. Philip Morris et al. : Final Opinion of Judge Gladys Kessler" (PDF). United States District Court for the District of Columbia. This page was last edited on 16 March 2019, at 01:38 (UTC).